September 17th is Constitution Day. America celebrates this day to commemorate when delegates came together in Philadelphia at the Constitutional Convention in 1787 and signed the U.S. Constitution into law. However, it wasn’t until 2004 that the holiday took on the full name it bears today. In 2004, Senator Robert Byrd passed an amendment renaming the holiday “Constitution Day and Citizenship Day,” which requires public schools and institutions to provide information on the history of the country’s Constitution. The Constitution is often called a living document since it can be amended through a governmental process. The process for amending the Constitution can be found in the Constitution itself. And it can often take time to add an amendment, a process the founders developed as an attempt to ensure the power remained with the people. Constitution of the United States and the Declaration of Independence (Pocket Edition) A pocket-size booklet containing the complete text of these two core documents of American democracy, the Constitution of the United States and the Declaration of Independence. House Document 112-129. 25th edition. Use this easy to read way to stay connected with the principles that have made America a bastion of democracy throughout its history. 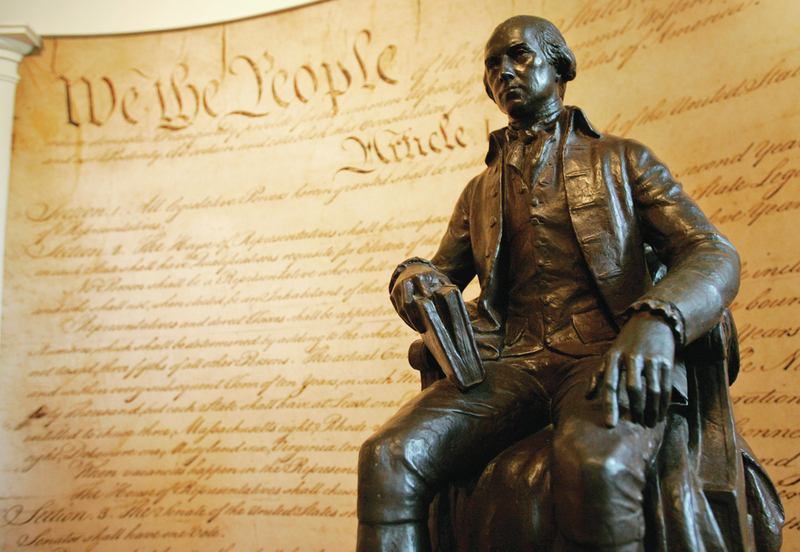 Image: James Madison statue in front of Bill of Rights. AP Photo. We celebrate Bill of Rights Day on December 15 every year in the midst of the bustling holiday season. Although it’s not a Federal holiday, it’s definitely a day for American citizens to commemorate the freedoms we enjoy by law. And no, the right to shop—while popular in America— is not listed in the Bill of Rights! The Founding Fathers drafted the United States Constitution during the First Constitutional Convention, held from May through September 1787 in Philadelphia. The completed draft constitution, sent to the States for ratification in September 1787, did not include any mention of individual rights. The framers’ focus was largely on structuring a strong government, and getting that structure put into place. Without such a structure, the Founding Fathers feared the country’s collapse into chaos or new attacks from outsiders. They left the issue of individual rights without adding it to the Constitution during that meeting. As a result of this omission, Edmund Randolph, George Mason, and Elbridge Gerry refused to sign the Constitution on principle. Maryland delegates Luther Martin and John Francis Mercer reportedly walked out of the Convention, at least in part because the draft did not include a Bill of Rights. In September, Randolph, Mason and Gerry joined in asking for a second constitutional convention to address the issue of personal rights. All three men advocated strongly for a bill of rights throughout most of the constitutional convention. The people ultimately adopted the Constitution, sans any bill of rights, on September 17, 1787. Eleven states ratified it and it went into effect in 1789. Founding Father James Madison was a delegate from Virginia who had been a key actor and speaker at the First Constitutional Convention. He had held onto the idea of the individual freedoms as discussed at that Convention. Although Federalist Madison was originally a skeptic about needing a Bill of Rights, like Randolph, Mason and Gerry he came to believe that the inclusion of personal rights was imperative to be added to the United States Constitution. and finally–in an argument borrowed from Thomas Jefferson–Madison argued that a declaration of rights would help install the judiciary as “guardians” of individual rights against the Legislative and Executive branches of the Federal Government. Thus, while serving in the first U.S. House of Representatives, Madison framed and introduced the Bill of Rights as legislative articles to amend the Constitution on June 8, 1789. He used as a model George Mason’s Virginia Declaration of Rights, written in May 1776, and also based his legislative articles in part on the English Bill of Rights (1689), the Magna Carta and other documents. 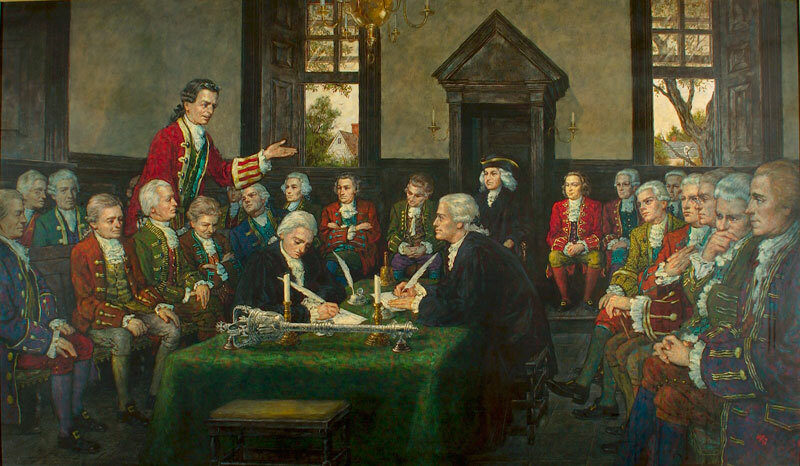 Image: This painting, The Adoption of the Virginia Declaration of Rights, depicting the adoption of the Virginia Declaration of Rights by the fifth Virginia Revolutionary Convention was made by Jack Clifton in 1974. It now hangs in the Virginia State Capitol. Courtesy: Virginia Memory online exhibit of the Library of Virginia. What rights are in Bill of Rights? Madison included in his articles a list of rights of the individual, such as free speech, freedom of religion, freedom of the press, free assembly, freedom from unreasonable search and seizure, and others, as well as some limits on government powers. 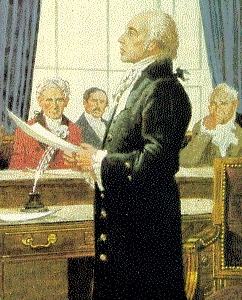 Image on the right: Madison reading his Bill of Rights to Congress. Courtesy: University of Missouri-Kansas City School of Law. On August 21, 1789, the U.S. House of Representatives adopted Madison’s articles, proposed them in a joint resolution of Congress on September 25, 1789, and finally ratified them on December 15, 1791. The Bill of Rights consists of the first ten amendments to the Constitution, and is a key “fundamental document” of the United States Federal government. 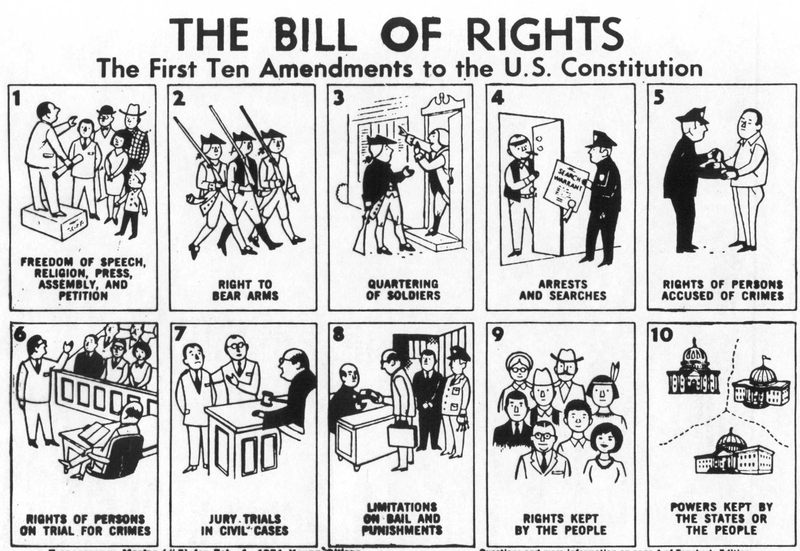 Image: Bill of Rights depicted in cartoon format from 1971 Young Citizen teacher’s guide transparency. Courtesy: Syracuse University. CLICK IMAGE TO ENLARGE and for teacher printable version. 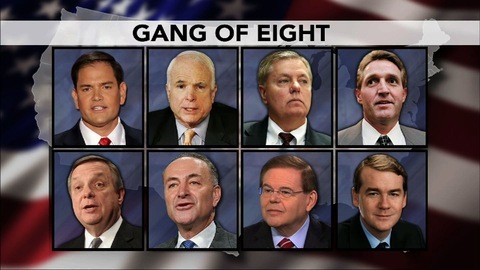 Sixth Amendment: Criminal Prosecutions – Right to a speedy public trial by an impartial jury, to confront witnesses and to counsel for defense. Tenth Amendment: States’ Rights- Rights not explicitly delegated to the Federal Government in the Constitution are reserved to the States or to the People. Where can you learn more about the Bill of Rights? 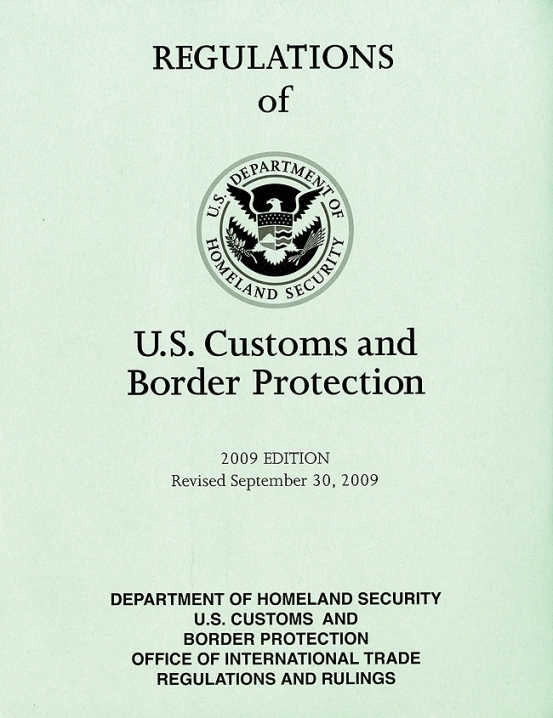 If you want to learn more about the Bill of Rights, an excellent place to start would be reading the source document, the Constitution of the United States and the Declaration of Independence; the GPO U.S. Government Bookstore sells a handy Constitution of the United States and the Declaration of Independence Pocket Edition. The full text of the ten amendments of the Bill of Rights is there for you to read and study. 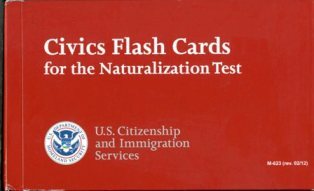 Kids in school, or adults wanting to revisit the fundamentals they learned in civics classes, can learn a lot from the Civics Flash Cards for the U.S. Naturalization Test (English Version)—and obviously the target audience, U.S. residents who want to become American citizens, will benefit from studying these, too. If you’re more comfortable reading en español, you can study using the same flash cards in Spanish: Tarjetas de Educación Cívica para el Exámen de Naturalización to cover the same material. 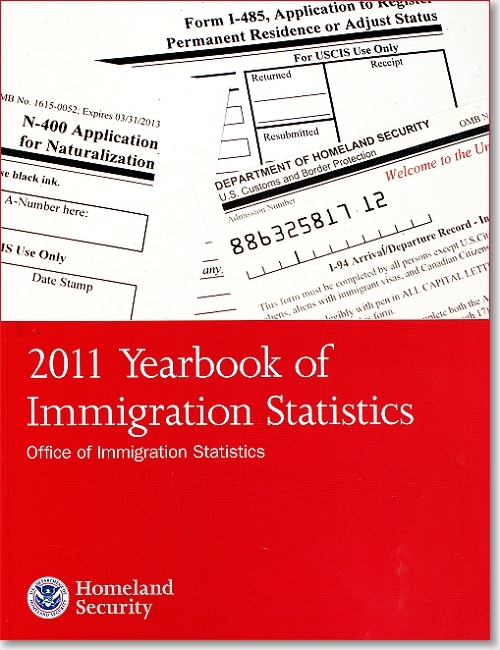 You can also listen to the same questions in English on the USCIS (US Citizenship and Immigration Services) website. (I didn’t see them offered in Spanish on their site, though.) If you’re cramming for the naturalization or a civics exam, listening to the questions is excellent reinforcement for your study plan. For even more challenging questions based on the U.S. 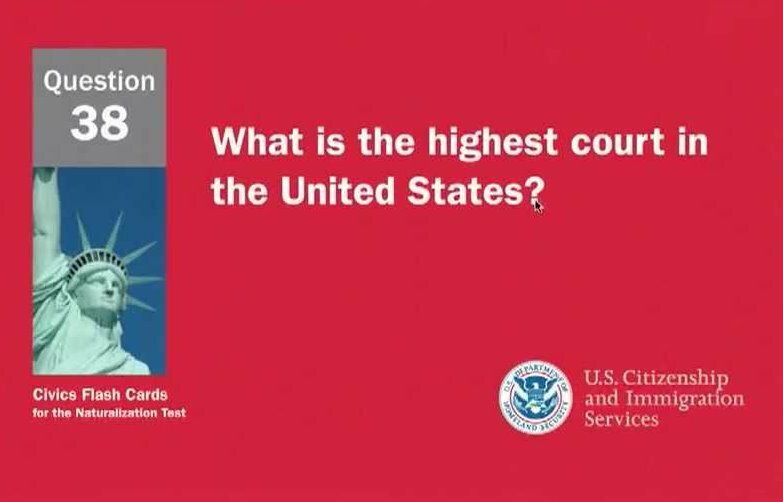 Citizenship test, take our fun Quiz: Are you smarter than an 8th grade Civics student? 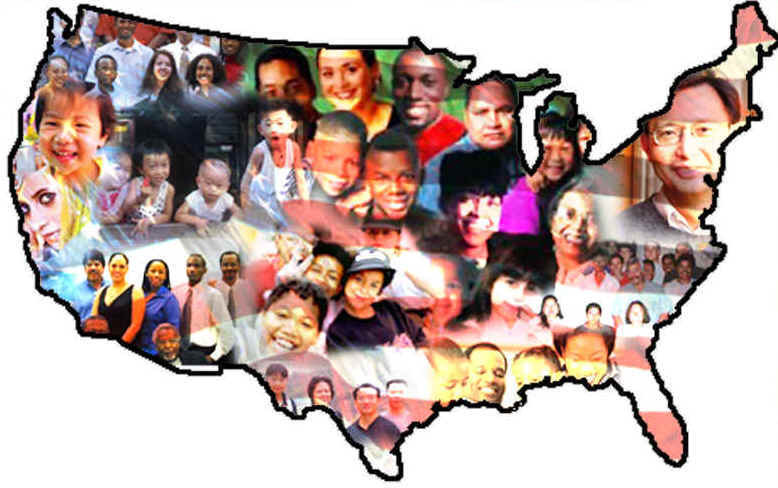 In-depth civics questions can be answered by the capsule summary answers to the questions in Learn About the United States: Quick Civics Lesson for the Naturalization Test 2013 (Book Plus CD). Students need to know the principles and background behind the answers, not just the answers themselves, obviously. You’ll definitely have a thorough grounding in the basics of American Federal government by the time you’re done with the lesson. Exercise your right to open discussion by reading some of these documents, and talking to friends about them. If you are a school student, maybe you’ll have an opportunity to write about the Bill of Rights or the freedoms the Bill of Rights guarantee. In this year, the 150th anniversary of the Emancipation Proclamation and the 50th anniversary of three significant events from the Civil Rights movement— the March on Washington for Rights and Freedom, the murder of African-American civil rights activist Medgar Evers who was involved in efforts to overturn segregation at the University of Mississippi, and the 16th Street Baptist Church bombing in Birmingham, Alabama— it’s a good time to reflect on our civil rights and liberties, and how lucky we are to have them. How can you obtain official publications that explain the Bill of Rights and other documents of American rights? The Citizen’s Almanac: Fundamental Documents, Symbols, and Anthems of the United States (Paperback) and digital edition as an ePub eBook. 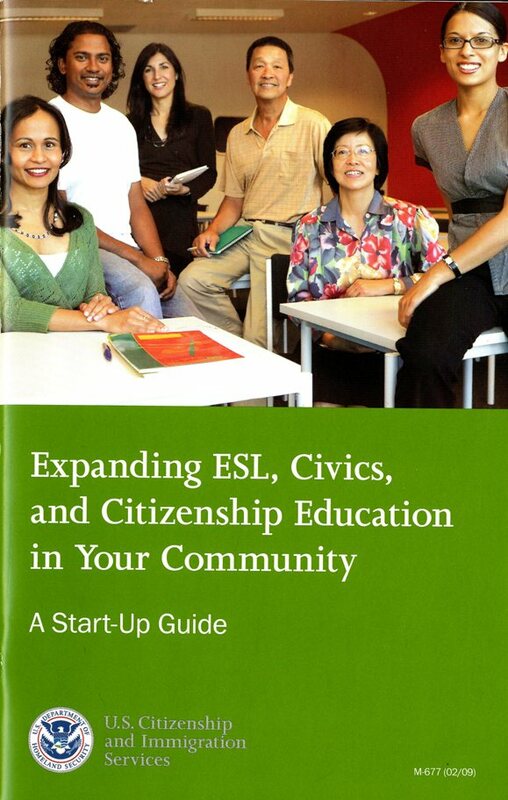 Expanding ESL, Civics, and Citizenship Education in Your Community: A Start-Up Guide (Paperback) or ePub eBook digital edition. In preparing for this Constitution Day blog post, not only did I retake the civics quiz from last year’s Constitution Day post (see Quiz: Are you smarter than an 8th grade Civics student? ), I also scrolled through my tablet last night, reading the Preamble to the Constitution and looking up related quotes. Then it occurred to me: if Founding Father George Washington had been alive today, would he have been a PC or an Apple guy? I’m betting our pragmatic First President would be a PC guy. I’m pretty sure innovator Thomas Jefferson would have been a stylish iPad man, and Benjamin Franklin, inventor of the bifocals, would probably be sporting Google Glasses now and tinkering with them. What is clear is that our Founding Fathers were strategic thinkers who realized that a fully functioning republic needed a clear but flexible code of law that evolved with the Nation. Thus, they wrote the Constitution of the United States, which has stood the test of time with over two centuries of amendments and interpretations by all branches of the U.S. Federal Government. 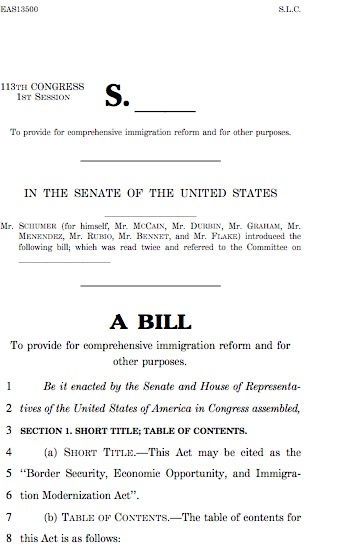 Since 1913, the Senate has directed that a publication be issued summarizing the current state of the Constitution to date, with all the amendments and the official interpretations, with the analysis today provided by the Library of Congress’ Congressional Research Service. This publication is called The Constitution of the United States of America, Analysis and Interpretation, popularly known as the Constitution Annotated or “CONAN” among the real insiders. This year marks the 100th anniversary of the Constitution Annotated publication, and to celebrate it and Constitution Day, the Government Printing Office (GPO) not only issued the Centennial Edition in print, but has also worked with the Senate Committee on Rules and Administration and the Library of Congress to develop and launch both a new mobile app as well as a web publication that make analysis and interpretation of constitutional case law by Library experts accessible for free to anyone with a computer or mobile device. The new resources, which include analysis of Supreme Court cases through June 26, 2013, will be updated multiple times each year as new court decisions are issued. Legal professionals, teachers, students and anyone researching the constitutional implications of a particular topic can easily locate constitutional amendments, federal and state laws that were held unconstitutional, and tables of recent cases with corresponding topics and constitutional implications. The new app and improved web publication will make the nearly 3,000-page “Constitution Annotated” more accessible to more people and enable updates of new case analysis three or four times each year. Even though our Founding Fathers could not have envisioned a digital future complete with the Internet and smartphones, the framework they put in place has been able to roll with the times. Americans know that our system is indeed a “complicated piece of machinery,” with our laws serving as the user manual, but tools like the Constitution Annotated– in print or now online or on your mobile device– now exist to help keep our machinery of democracy well oiled. 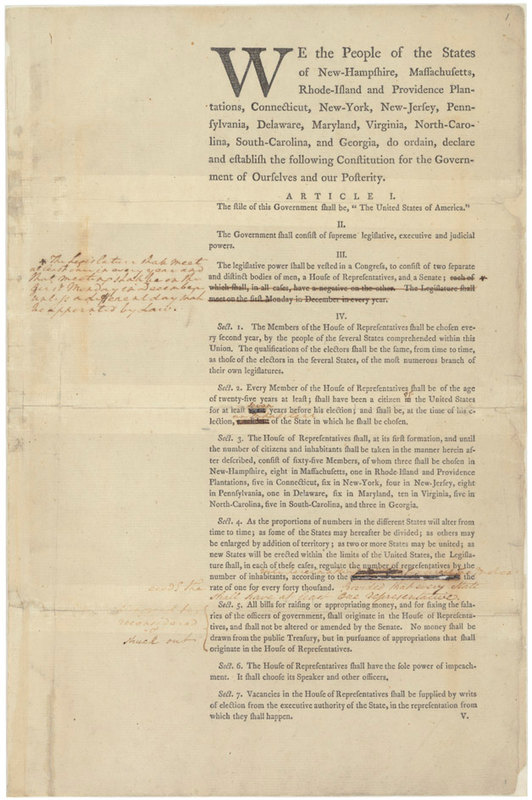 How can I obtain The Constitution Annotated? Shop Online: You can purchase the print edition from the U.S. Government Online Bookstore at http://bookstore.gpo.gov by clicking on the links above in this blog post or shopping our Constitutional Law collection under our Laws & Regulations category. Buy the Constitution of the United States and the Declaration of Independence (Pocket Edition) and other Civics products in our Citizenship & Civics category. Visit our Retail Store: Buy a copy at GPO’s retail bookstore at 710 North Capitol Street NW, Washington, DC 20401, open Monday–Friday, 9 a.m. to 4 p.m., except Federal holidays, Call (202) 512-0132 for information or to arrange in-store pick-up. Find them in a Library: Find it in a federal depository library. For Apple iOS Devices: Download the new Constitution Annotated app for iOS devices for free from Apple’s iTunes Store or via this direct link: http://beta.congress.gov/constitution-annotated/. · For Android Devices: An Android version of this app is under development. 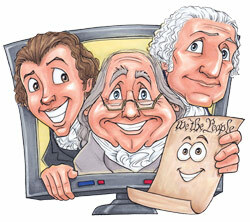 The Constitution Annotated web publication will be available on GPO’s Federal Digital System (FDsys) www.fdsys.gov as a digitally-signed, searchable PDF that includes a linked table of contents, a linked table of cases, a linked index and GPO’s Seal of Authenticity on every page. The new Constitution Annotated and a suite of constitutional resources can be viewed at http://beta.congress.gov/constitution-annotated/. The page features links to the app stores, an interactive table listing recent cases of high interest, a bibliography of Constitution-related primary documents in American history and tips for searching the Constitution Annotated on GPO’s website at www.gpo.gov/constitutionannotated.